Carte des Courones du Nord comprenant la Suede, le Danemarc, &c. . .(2 maps) - DEZAUCHE, J.A. / BUACHE, Ph. Title : Carte des Courones du Nord comprenant la Suede, le Danemarc, &c. . .(2 maps). Map maker : DEZAUCHE, J.A. / BUACHE, Ph.. Size : 36.6 x 24.4 inches. / 93.0 x 62.0 cm. 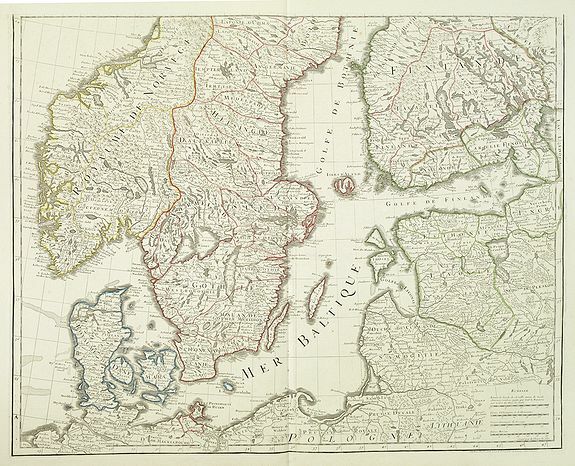 Description :Large and detailed map of Scandinavia after de l´Isle, G. It shows Norway, Sweden, Finland, Denmark and part of Russia. With a brilliant figurative armorial cartouche. 2-sheets map. Condition : Good impression on solid, bright paper. Wide margins. Very good condition. If joined together 930x620mm.